Computer science has long been considered to emphasize three different perspectives: mathematics, science, and engineering. Mathematics appears in computer science through mathematical formalism, mathematical theories, and algorithms, which are ultimately mathematical objects that can be then expressed as programs, and vice versa. Engineering, which is concerned with making things better, faster, smaller, and cheaper, is prevalent in computer science. Science may be defined as developing general, predictive theories that describe and explain observed phenomena, and evaluating these theories, say via hypothesis testing. While the database field has some very strong mathematical and engineering work, the scientific perspective has been much less prominent. This project takes a scientifically rigorous approach to an area previously dominated by the engineering perspective, that of database query optimization. Our goal is to understand cost-based query optimizers as a general class of computational artifacts, to come up with insights and ultimately with predictive theories about how such optimizers, again, as a general class, behave. 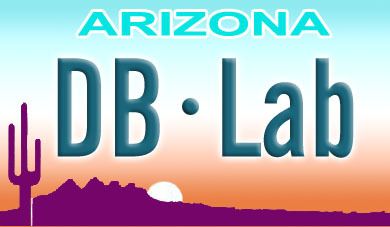 Young-Kyoon Suh, "Exploring Causal Factors of DBMS Thrashing," Ph.D. Dissertation, Department of Computer Science, University of Arizona, April, 2015 (pdf). 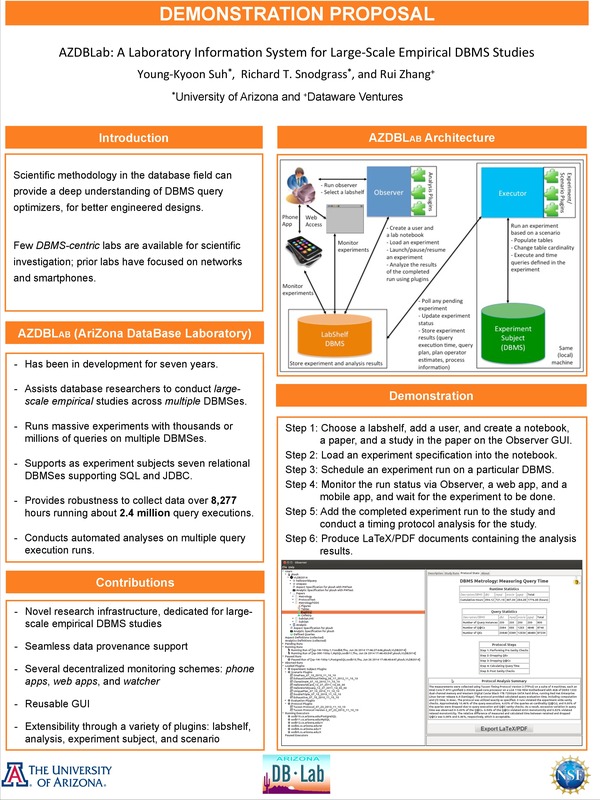 Young-Kyoon Suh, Richard T. Snodgrass, and Rui Zhang, "AZDBLab: A Laboratory Information System for Large-Scale Empirical DBMS Studies," Demonstration track, Proceedings of the VLDB Endowment, Vol. 7, Issue 13, pp.1641–1644, Hangzhou, China, September 2014. (pdf, poster). 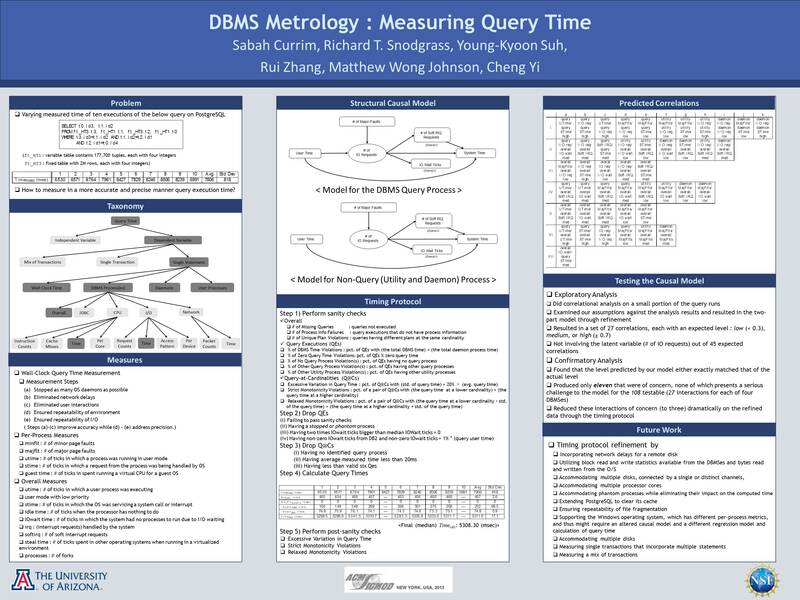 Sabah Currim, Richard T. Snodgrass, Young-Kyoon Suh, Rui Zhang, Matthew Wong, and Cheng Yi, "DBMS Metrology: Measuring Query Time," Proceedings of the SIGMOD International Conference, pp. 421-432, New York City, June 2013. (pdf, poster). Clayton Morrison and Richard T. Snodgrass, "Computer Science Can Use More Science," Communications of the ACM, Vol. 54, Issue 7, June 2011, pp. 36-39. (pdf). Richard T. Snodgrass, "Towards a Science of Temporal Databases," Keynote Address, Proceedings of the International Symposium on Temporal Representation and Reasoning, Alicante, Spain, V. Goranko and X. Sean Wang (ed), pages 6-7, June 2007. (pdf). Rick Snodgrass gave a talk at North Carolina State University (a 62-minute video is here) in January 2013 presenting the general philosophical foundation of ergalics as well as a specific demonstration of database ergalics. Here's a short video made in 2012 by some of the undergraduates in the project about the project's software and experiments. Seminar in the "Science" of Computer Science, Spring 2007.